You’ve got questions, we’ve got answers! 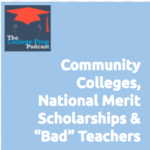 Join us as we discuss community colleges versus big name schools, getting national merit scholarships, and dealing with bad teachers. COMMUNITY COLLEGE VS. BIG NAME SCHOOL. Our son has been accepted to Engineering programs at Baylor, A&M Galveston and Ole Miss. However, his first choice, UT on Friday confirmed Cap program only which would be UTSA and transfer only guaranteed into Liberal Arts. As you may recall, the full college experience including D1 sports, fraternities, etc was all on his list. However, he is now talking to two other young men from his high school about Austin Community College. We’re reaching out to several people for their thoughts and expertise. In your opinion what is his best option? From Jackie. NATIONAL MERIT SCHOLARSHIPS. I’m working with a small private school in my area and wanted your input on how we can best support our students for next year’s National Merit scholarships. I analyzed the results of the 10th-grade class PSAT results and this is what I found: – 41 students took the test – 2 students tied a score of 1300 – 3 students scored higher with a 1310, 1340 and 1400 points. I want to “target” some of these students and suggest they work to possibly qualify for National Merit. What scores do you think might have a chance? WHAT TO DO ABOUT A BAD TEACHER: My English teacher legit spends the majority of class talking about things that aren’t relevant. (I.E. She’ll talk about her son in the Navy instead of whatever book we’re reading at the time). The other day we were given the assignment to write a thematic essay based on the movie “I am David,” and she decided to give us some free time to work on it on our own. Well, a few kids got done early and began talking amongst themselves, and my teacher completely flipped out! She made the whole class start over! Those of us who hadn’t finished, but had gotten a good chunk done had to turn it in and re-write it with a different thesis and everything. This teacher has been teaching at my school for more years than I care to count and has received a couple “teacher of the year” awards – though I can’t imagine why. I get all A’s and B’s, but I have a solid D in her class – as does everyone else I’ve asked. I’ve tried talking to my school counselor about it – as have a few others – but whenever the administrators come in to monitor the class the teacher will give us an assignment to work on while she talks to them about their families and such. I got a letter home the other day from the principal getting angry at me for “disrupting the class” when I refused to listen to her about her son’s week aboard the SS I-couldn’t-care-if-I-tried for the umpteenth time and tried to work on my essay instead. What am I supposed to do? Listen in to Megan and Gretchen with guest speaker Debbie Lehr-Lee as they discuss how to grow a thriving Academic Life Coaching business.